Dr. James E. Vogel discusses advancements in surgical hair restoration and the importance of follicular unit extraction and grafting techniques in achieving aesthetically pleasing results. 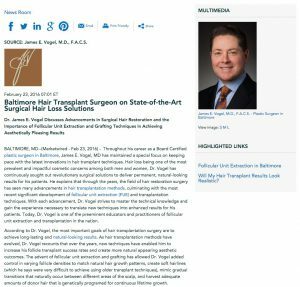 Baltimore, MD – Throughout his career as a Board Certified plastic surgeon in Baltimore, James E. Vogel, MD has maintained a special focus on keeping pace with the latest innovations in hair transplant techniques. Hair loss being one of the most prevalent and impactful cosmetic concerns among both men and women, Dr. Vogel has continuously sought out revolutionary surgical solutions to deliver permanent, natural-looking results for his patients. He explains that through the years, the field of hair restoration surgery has seen many advancements in hair transplantation methods, culminating with the most recent significant development of follicular unit extraction (FUE) and transplantation techniques. With each advancement, Dr. Vogel strives to master the technical knowledge and gain the experience necessary to translate new techniques into enhanced results for his patients. Today, Dr. Vogel is one of the preeminent educators and practitioners of follicular unit extraction and transplantation in the nation. According to Dr. Vogel, the most important goals of hair transplantation surgery are to achieve long-lasting and natural-looking results. As hair transplantation methods have evolved, Dr. Vogel recounts that over the years, new techniques have enabled him to increase his follicle transplant success rates and create more natural appearing aesthetic outcomes. The advent of follicular unit extraction and grafting has allowed Dr. Vogel added control in varying follicle densities to match natural hair growth patterns, create soft hairlines (which he says were very difficult to achieve using older transplant techniques), mimic gradual transitions that naturally occur between different areas of the scalp, and harvest adequate amounts of donor hair that is genetically programed for continuous lifetime growth. Additionally, he has adopted innovative techniques such as the use of HypoThermosol® to store and enhance the survival and growth of hair grafts during the procedure, as well as postoperative ATP spray to provide external energy for newly transplanted grafts during the early post-surgical period. The Baltimore plastic surgeon explains that patients who do not have enough hair in the “permanent zone” of their scalp can now often benefit from follicular unit extraction harvesting from the beard area and, in extreme cases, other areas of the body. There has never been a better time for men and women experiencing hair loss to explore their options with hair transplant surgery, Dr. Vogel says. Even individuals who have had transplants done in the past may want to find out more about how follicular unit extraction and grafting can help improve upon the results of their previous transplantation procedure. With corrective hair transplant surgeries, Dr. Vogel explains that unnatural looking hairlines, bulky grafts, scar tissue, new areas of hair loss, and various other aesthetic issues that may result from a poorly executed hair transplant procedure can often be corrected with excellent results. Since these corrective surgeries require creative thinking, thoughtful surgical planning, and well executed solutions, however, he adds that the key is to find a surgeon who has the proper experience and expertise. The innovative transplantation techniques of today enable Dr. Vogel and other well-trained and board certified surgeons like him to provide the highest degree of surgical customization possible. He encourages all individuals affected by hair loss to seriously consider the options available through state-of-the-art hair transplant surgery. He points out that the renewed confidence and vitality typically associated with the results of advanced hair transplantation can make it well worth the pursuit. About James E. Vogel, M.D., F.A.C.S. Dr. Vogel leads his own private plastic surgery practice in Baltimore and is certified by the American Board of Plastic Surgery. He is a member of the American Society for Aesthetic Plastic Surgery, the Johns Hopkins Medical Society, the American Society of Plastic Surgeons, and the International Society of Hair Restoration Surgery. Dr. Vogel has been recognized as a Top Doc in Baltimore Magazine consecutively for the last four years. As an Associate Professor in the Division of Plastic Surgery at the Johns Hopkins School of Medicine, he is a respected authority and educator in the aesthetic field. At his practice, Dr. Vogel offers advanced hair transplant options, cosmetic surgery procedures for the face and body, and non-surgical aesthetic treatments. He is available for interview upon request. For more information about Dr. Vogel and his practice, please visit drvogelplasticsurgeon.com or facebook.com/drjamesevogel. James E. Vogel, M.D., F.A.C.S.